The week before Christmas, three of my best friends and I headed to Disneyworld for one of the most fun-filled vacations I've ever had. I was four years old the last time I'd been at Disneyworld, so many things I didn't remember and much has changed since then! Over the next few weeks, I'll be giving you little recaps of our time at Disney, including my favorite rides, restaurants, sights, and shows. To get this party started, let me tell you about some of my favorite things in Epcot! Don't miss the chance to experience the cultures of eleven different countries in Epcot's World Showcase! Mexico, Norway, China, Germany, Italy, the U.S.A., Japan, Morocco, France, the United Kingdom, and Canada are just sitting there waiting for you to come visit. There are shops, restaurants, art galleries, rides, and nooks and crannies hidden all throughout the showcase. Fun fact: the employees who work in those eleven countries are actually from the particular country where they work! I thought that was super fun. Our waitress in Germany came over to work for Disney in 1983 when the World Showcase first opened, and she liked it so much she decided to stay! It was so fun meeting people like her from different countries and cultures. I'd love to spend a whole day meeting those Disney employees and listening to their stories. Oh my goodness. We had several dinner reservations in Epcot, and I think our overall favorite experience was at Biergarten. In the middle of Germany, Biergarten is designed to portray a traditional Bavarian village where you can eat authentic German food and be entertained by a live band! We were there during Christmas time, and they played Silent Night while everyone in the restaurant sang along. It was beautiful! This was one of my favorite rides when I was at Disneyland last year, and I was so excited to ride it again at Disneyworld! Soarin' takes you on a hand-glider flight above California. You'll get to experience many of the sights and delicious smells of California. If you can, I'd suggest using a Fastpass on this ride as the wait time tends to be long...but it's totally worth it even if you have to wait! This is a great evening show to wait around for at Epcot. It's full of lights, lasers, music, waterworks and fireworks! Grab a spot by the water around the World Showcase and enjoy the show! Dining with the princesses in Norway is one thing we did not get to do, but I wish we had! I hear it is magical, and it's definitely on my list of things to do on my next Disney adventure. I love authentic Japanese cuisine, and I love it when they cook your food right in front of you! It's a fun and entertaining meal time for the whole family! Hop on the monorail for a quick getaway to Magic Kingdom. On your way, you can stop by and explore the Contemporary resort! The Nemo ride is cute and fun. It incorporates real fish and sharks and stingray in a tank with characters from Finding Nemo. After the ride, be sure to stick around to explore the aquarium. Watch out for jellyfish, visit the manatees, try to name as many fish as you can, and wave at the sea turtles. Then coo coo ca choo, find your way back to the big ol' blue. Raise your hands, Nemo fans. I know you're out there! 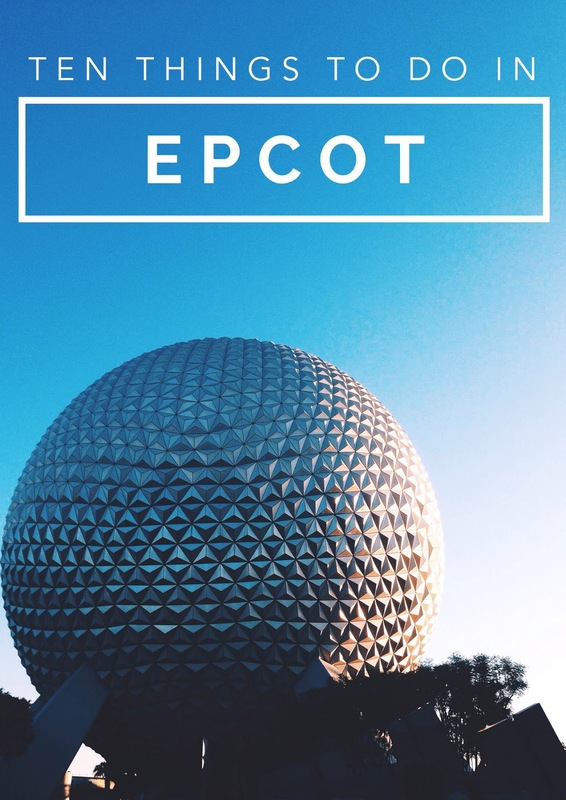 HAVE YOU EVER BEEN TO EPCOT? WHAT WOULD YOU ADD TO THE LIST? This list is making me jealous of your trip! I went to Epcot when I was in middle school but have pretty vague memories of it. I would love to go back and experience all of the Disney magic, for now I will live through your pictures! This list is great! I'd add Test Track to the list though :)! Oh man, I know! We never got to Test Track because the line was always SO long and we were usually pressed for time at that point to get to a reservation or another park! Next time, though! Friend, you should totally take another trip now as an adult. We had SO much fun and I was able to appreciate everything so much more! Wow!! You took such beautiful photos, love them!! The last time I went to Epcot it was during the Food and Wine Festival a few years back! Inspired to plan a girl's trip there to slow down and enjoy Epcot this time! Oh thank you! I didn't want to tote around my DSLR all day, so I just snapped photos on my iPhone. :) Haha! You guys should definitely go again!! It was a blast! Meg! I want to go to there! I love all your pictures... also I want to eat all the food. The food was delish and the parks were magical! Girl, yes. You need to plan a Disney World vacation!